Over 100 movies have a storyline based on the theme of “Road Trip” – from Easy Rider to Cannonball Run, from Y Tu Mamà Tambien to The Muppet Movie. Whether you’re laughing through Wild Hogs or National Lampoon’s Vacation, cringing with fear through Thelma & Louise or Duel, or wistfully relating to real moments in Little Miss Sunshine or Sideways, road trips provide the widest canvas for creating images of every shade and hue. Anything can happen once you hit the road. The lure of the highway represents man’s Call to Adventure. 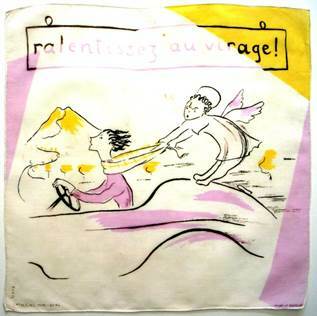 Travel by plane, train or ocean liner, as seen in Bon Voyage required time and money. 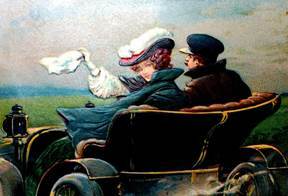 But a car spelled instant escape, even if only for an afternoon – on your timetable and wherever you wanted to go. No longer need you live near the office in a building with families piled on top of one another. Suburbs grew like kudzu. Your children could play in fresh air; your wife could shop from a variety of vendors. 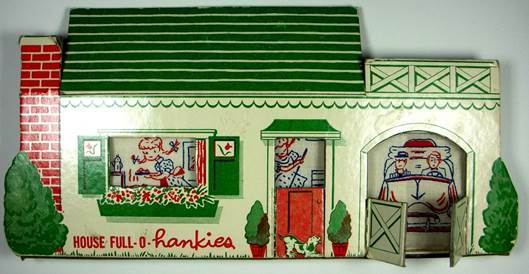 This children’s House Full o’ Hankies typified the American Dream, complete with a car in the garage. Little Susie bakes a pie and sweeps (indeed times have changed) while mom and pop flip the convertible top and go for a Sunday spin. Slip the hankies from their cardboard sleeve, and you’ll find images on the reverse which reinforce the importance of the car. Look closely. They’ll eat peanut butter if necessary, as long as they can keep the car. For nearly 60 years, a two lane road ran 2,448 miles from Chicago to LA, connecting folks from the parched Midwest to the cool breezes of the Pacific. From Oklahomans fleeing famine in the 1930’s to the beat generation’s On the Road paean to freedom in the 1950’s (see 50 Shades) the open road has always conjured images of escape, adventure, and opportunity. From Dorothy’s Yellow Brick Road to Oz to Marco Polo’s Great Silk Road connecting Europe to the exotic Far East, roads beckon us onward to travel and explore. Cars made family vacations an affordable reality. Pile the kids in the back, and let’s visit the Washington Monument, see the Liberty Bell, or tour the Alamo. I remember a few times we went on a road trip, we had some breakdowns on the way there. We had to get a few different tow trucks Lynchburg to help us on our road trips. 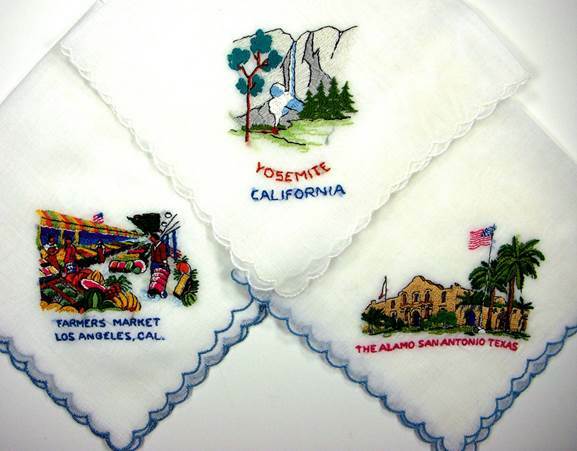 But when we got there, handkerchiefs provided the perfect souvenir – packable, unbreakable, inexpensive. Breakdowns aren’t the only thing to be aware of on roadtrips; other drivers can be a big source of misery, especially when you remember that car accidents can happen to anyone. Those involved in car accidents may want to reach out for legal help from someone like an Edmond car accident lawyer. 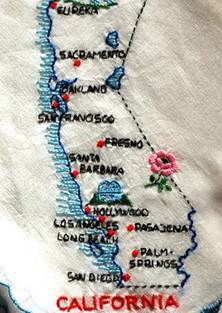 The following embroidered specimens are still like new. A lady might tuck one in a breast pocket to accent her outfit, but they were considered keepsakes, never utilitarian. 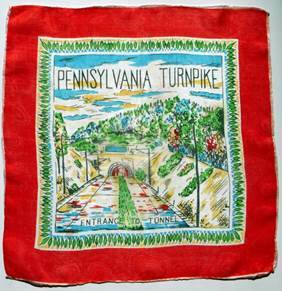 Lovingly cared for, these scallop-edged hankies were made by the hundreds and can easily be found today. These silk beauties are gossamer thin and, trust me, impossible to iron. Being 100% silk, they hold color beautifully, and are as richly hued as they day they were new. 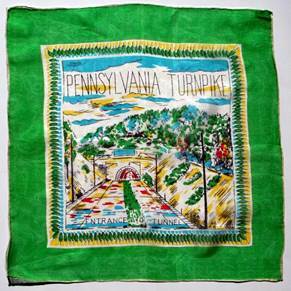 But it’s the subject matter that’s a kick – the Pennsylvania Turnpike! I have a friend who told me he thought it was a “big deal” when his dad “paid money” to drive on the turnpike. He assumed it must be a “very important” road. 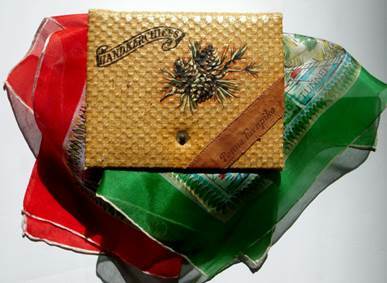 Not only hankies, but hand painted souvenir handkerchief boxes were coveted souvenirs from a special trip. In the days before ipods, ipads, kindles, and movies in the car, kids played highway bingo – spotting ‘birds on a wire’ and ‘Burma Shave’ signs, or read comic books. 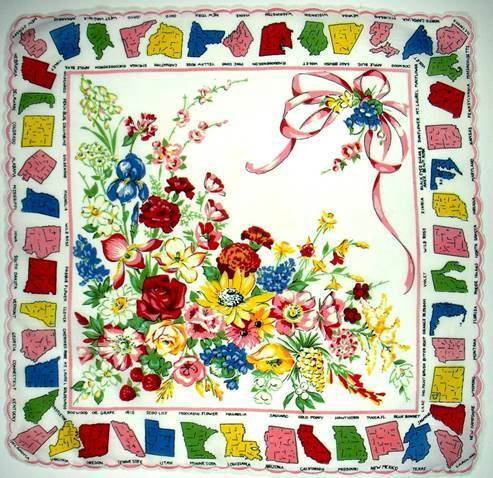 The following hankies allowed moms to teach their children the state capitals or state flowers. Note they’re all pre-1959, as neither Alaska nor Hawaii are included. 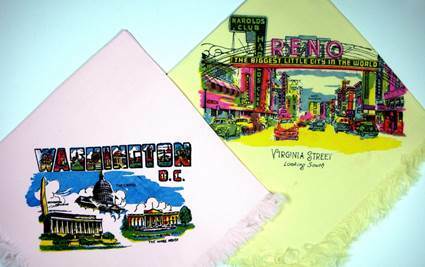 The colors are subtle and sophisticated; combined with the scalloped edges, they provide a lovely accessory to carry on a day of sight-seeing. 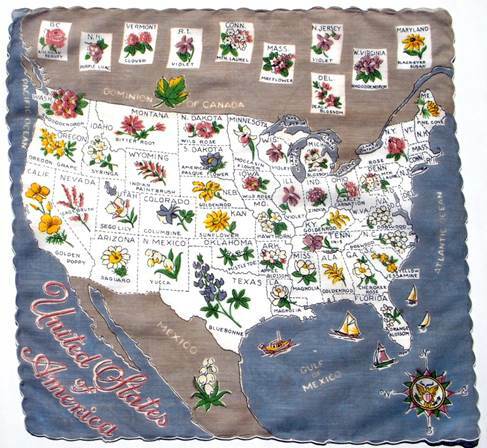 Charming bouquet hankie with a colorful perimeter of state flowers. Talk about home schooling! 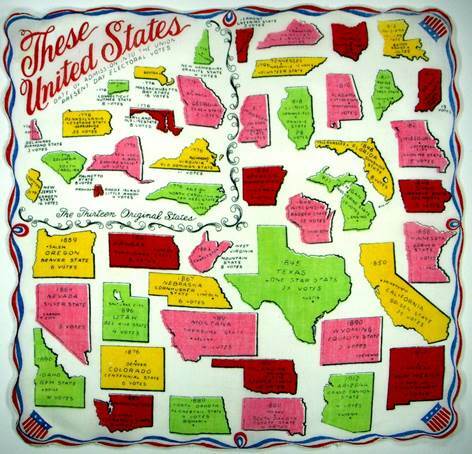 This hankie delineates each state’s date of admission to the union and number of electoral votes, as well as a listing the thirteen original colonies. Guess we should have included this one in our Vote! blog. (Frankly, anyone who foists this little number on the kids should be forced to run behind the car for at least a mile.) 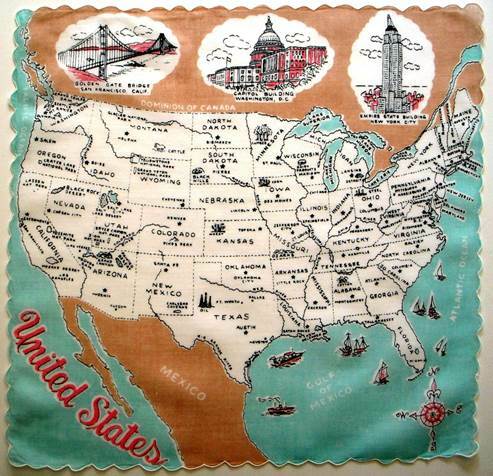 I do, however, love the intertwined patriotic border. It’s festive and fun. Once you have the sun on your face and the wind in your hair, it’s only natural to rev up the horsepower. This little French motorist’s guardian angel reminds her charge to take it easy on the curves. Her methods are a wee bit Isadora Duncan for me, but let’s hope everything turns out alright. 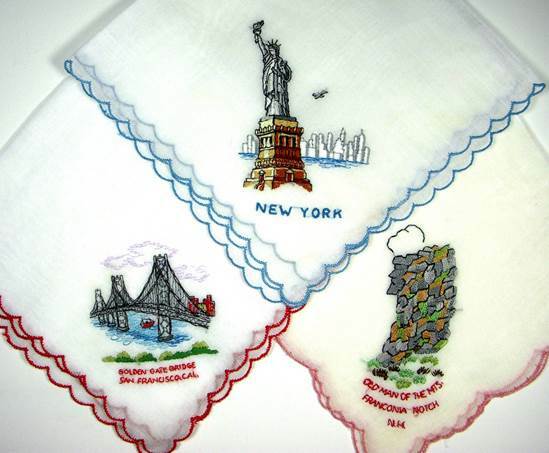 Many souvenir hankies depicted the entire state, with cities or landmarks highlighted. The work was all done by hand and really terrific. I’m thrilled so many have survived. Here, the artist even took the time to include waves lapping the Pacific shore. 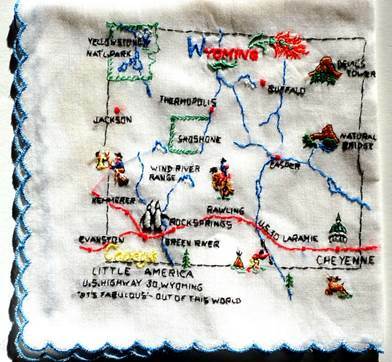 Note the detail on the leaping deer, as well as the Indian and his teepee in the southeast corner of Wyoming. Wait a minute. What are penguins doing in Wyoming? Little America was a chain of hotels, originating in Wyoming and included Cheyenne, Salt Lake City, UT and Flagstaff, AZ. Founded in 1952 with two fuel pumps, a café, and 12 rooms, the original location now hosts 140 rooms and 55 fuel pumps. Fifty-five? Yikes. The penguin logo is a reference to Admiral Byrd’s remote Little America station established in Antarctica. The penguin was used to remind travelers there was nothing else available for miles in any direction, so they’d better stop here, rest, and fill the tank. Mighty clever. 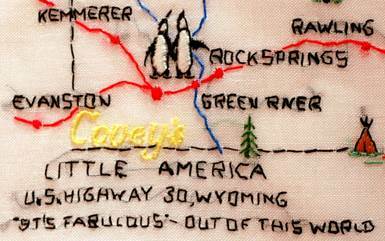 Note although the word Covey’s is machine stitched, all other embroidery is done by hand. America’s new one stop Travel Center. Coffee Shop, 110 beautiful Motor Lodge rooms, Store, Fountain, Cocktail Lounge, beautiful Rest Rooms, Bus Stop, Super Service Station, Garage, Truck Pit, Giant Paved Parking Areas. Famous Coast to Coast – Now Even Better. Giant Paved Parking Areas! Whoopie! Years later Joni Mitchell would bemoan the practice of paving the landscape in her song Big Yellow Taxi. ” They pave paradise, and put up a parking lot.” At this time in history, however, parking lots were as few and far between as expedition stations in Antarctica. If you’re old enough to remember S&H green stamps – note Covey’s also provides those! We can’t bring our road trip to a close without a tip of the hat and heartfelt thank you to Detroit, the city that made it all possible. Back in this era, the only foreign car was a Volkswagen. (First sold in the US in 1949, their sales total for the first year = 2.) Toyota, Honda, and others were decades down the road. It was ‘The Big Three’ General Motors, Ford, and Chrysler who put Americans on the road. For years they were the largest automakers in the world, and two of them remain among the top five. Detroit enabled people to live the dream – freedom to travel, see American history first hand, and possibly even live away from city crowds. Those who devoted themselves to building a great industry and employing thousands deserve to see it return to a stable, thriving metropolis, and I, for one, am rooting for them. 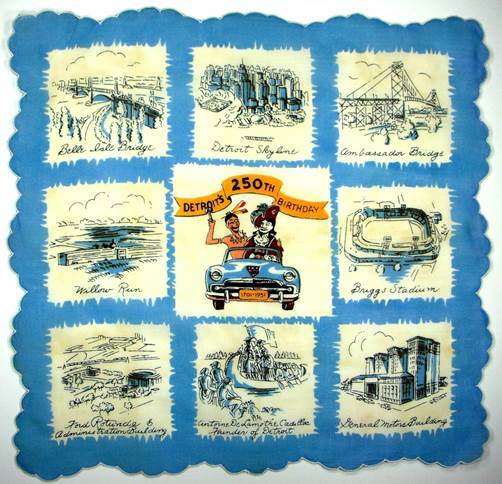 This 250th Anniversary hankie from 1951 says it all. It highlights General Motors, the Ford Rotunda, and the founder of Detroit – Antoine de la Mothe Cadillac. Who is that riding shotgun? Chief Pontiac of the Ottawa tribe. The Indians helped the French keep the English at bay, which not only preserved the fur trade, but helped support the colonists in establishing free states. No surprise then, that GM named cars for both Cadillac and Pontiac. So whether your road trip takes you along the Champs-Elysées or the Las Vegas Strip, down Wall Street or beside the Hollywood Walk of Fame, to Orchard Road in Singapore, the Via Dolorosa in Jerusalem, the Autobahn in Germany, or Main St. USA, do savor the trip. Take a moment to wave your hankie at a passing stranger (as the saying goes, he’s just a friend you haven’t yet met) and be grateful you have the opportunity to enjoy the freedom of the open road. 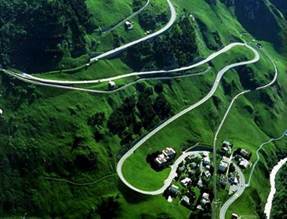 Whether you decide to meander along the Oberlap pass in the Swiss Alps or squiggle down Lombard St. in San Francisco…get going! There are a gazillion road songs, but we’ll share just one classic here. 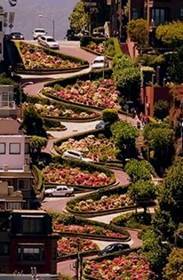 Route 66, sung by Natalie Cole. Oklahoma City looks mighty pretty. Our website is, after all, Handkerchief Heroes, so we’d be remiss to exit without providing you with a roadmap for the hero’s journey. Screenwriter Christopher Vogler’s The Writers Journey distills Joseph Campbell’s Hero With A Thousand Faces, into an easy to follow, eminently enjoyable read, outlining the characters, challenges and circumstances every hero encounters in his search for adventure, including the rewards, resurrection and renewal he undergoes in body, mind and spirit on his journey toward growth.